On Monday night, as is not unusual; I went to do some laundry: dutifully separating the whites from the colors, and putting the bright reds in a separate pile. I loaded the whites into the washer, loaded the soap and the bleach (I only ever use bleach with whites), turned the trusty clothes washer selector to ‘whites’, pressed the little pink ‘control on’ button, and then pressed the little teal-colored ‘start’ button — a sequence that I have repeated many hundreds of times. I mean we’ve had this washer for over 15 years, and done at least 2 or three loads a week in it. I am at this point, to be rewarded with the sound of the little relay that ‘locks’ the front door of the washer, and the sound of water begins to fill the clothes washer. But on Monday night: I press the ‘control on’ button, the displays all light up indicating the washer is ready for my next command. I press the little teal ‘start’ button, expecting some audible rewards. But in this case: nada, nothing, silence. Nothing seems to happen at all. OK, I think: I just got a sock stuck in the door or something equally dumb. I re-check everything. Open and adjust the clothes, check that the washer is plugged in, check that I don’t have the wash-cycle selector in some ‘in between’ state, etc. I repeat the sequence for starting. Nothing happens. I mean no indication at all that I have pressed the ‘start’ button. Everything else seems right. Except — wait a minute. That button doesn’t ‘feel’ right. Normally when I press it, I hear and feel a little spring ‘click’ (kinda like what it feels like to press a key on a computer keyboard — only not nearly as much movement). There’s supposed to be a bit of ‘spring’ to the whole experience. Press the key, hear a tiny little click, feel the button ‘spring’ back to its original location. You know, like any idiot — I mean even I could do! And so, I says to myself, like the geek that I am: to the Internet! 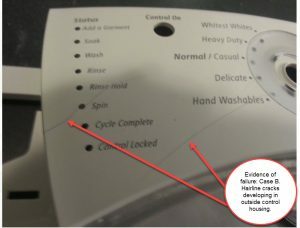 And of coarse, when I Googled up my clothes washer model number (hoping to get a copy of a repair-manual). And… of coarse I got PLENTY of information. Just not quite what I was looking for. 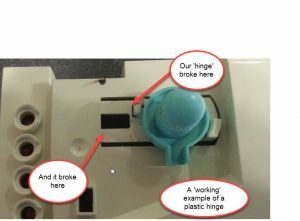 There was one intriguing link for ‘what do do when your washer won’t start’, that had 5 different reasons ranging from ‘plug it in’, to ‘press the start button’, and culminating in ‘replace the control panel’. Yikes — not quite what I was hoping for. 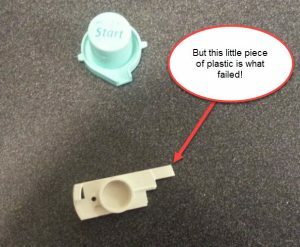 Another link to a discussion board thread suggested that yes indeed the ‘start button’ could very well be the culprit behind the symptoms I was seeing; and even went on to explain a likely failure scenario. Now we’re getting somewhere, I says to myself! This sounds EXACTLY like what I’m seeing! But… how to tear my clothes washer apart to inspect this suspect switch? I hadn’t a clue. Thankfully, there is YouTube! 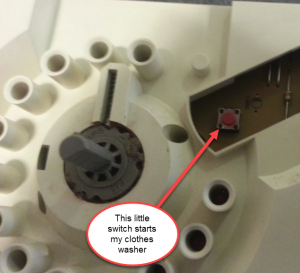 And sure enough, when I Googled ‘replacing the start switch’ on my specific Whirlpool clothes washer model and presto: Washer Start Button (Whirlpook part number 8181861) Replacement. I mean — ya gotta love YouTube! Great video, and the guy even speaks my native language! OK, so I clear all the junk off the top, and I unhook all the hoses, and I make a big water mess all over the floor on Monday night. And then I tear into the washer first thing on Tuesday morning, thinking the whole time: I hope I don’t have to invest $250 in a 15-year-old washing machine. I expected to have to replace some electronics (you know: like a switch that was wave-soldered into a circuit board). That’s not at all what I found once I had the whole thing taken apart (went just like the YouTube video showed) however. You can see in the above picture EXACTLY how and where the other button ‘hinge’ broke off. This is really bad design. By which I mean: I think it was DESIGNED to fail pretty much how and why it did. OK, you say: but it’s a 15-year-old washer. Things break, moving parts fail. Yeah, I hear you; I get it. But…how come none of the ‘moving parts’ actually failed here? How come some electronics didn’t fry? The plastic housing failed. And not from um ‘forceful use’ if you catch my drift. Despite my cavalier attitude towards clothes washers as a general rule, I never hit it with a hammer; or even whacked it with my fist. I never left my washer out in the sun, nor did it ever at any time drop to a freezing temperature. Unless the occasional foul word did in fact break some plastic, that’s just not what happened. Here’s what killed my washer: time. And cheap plastic. The plastic gradually (as in over many years) lost it’s flexibility, lost it’s ability to move (even the millimeter or so required by our spring hinge), and it just snapped apart. Now it didn’t help that the plastic hinge-design is fragile, that its cut-outs and supports are almost ridiculously thin. But still I wonder: shouldn’t these plastic parts (this one was INSIDE of another plastic shroud, which was in turn INSIDE a metal case, which in turn was INSIDE a house for it’s entire term of existence) last a little longer than 15 years? Isn’t this the VERY SAME plastic that I have been told NOT to throw into landfills because it will not begin to break down for THOUSANDS OF YEARS?